The better approach requires a Data Base engine (sorry Excel cave folks! ): by combining a series of INDB tricks and SQL functions, this can be done in a couple of easy clicks with great performance, at no additional storage cost. As I am preparing a promotion on Technology products, I need a list of customers who purchased over $100 worth of Technology Product Category on their last Order, to email them that promotion. In order to prepare those emails, I want to research their purchase history, with a basket analysis for instance. Therefore, I need all the order line items for that subset of customers. If I run that promotion multiple times, or if I run another similar promotion with slightly different criteria, I would really benefit from having a clean Alteryx workflow to run at will with updated data sets. 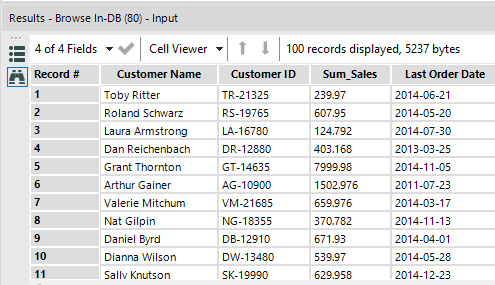 Using that simple additional Join In-DB tool on Customer ID, I retrieve for those 165 relevant customers 2,165 Order Line items, ready for analysis. Those techniques open so many possibilities to handle aggregation levels, that I highly recommend you reproduce those steps on your own, to get familiar with those precious Window Functions. 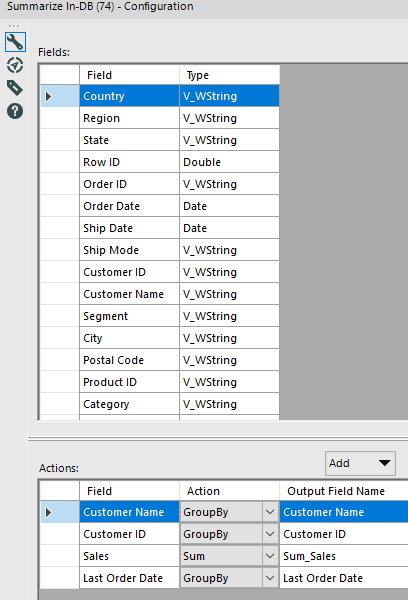 This entry was posted in Alteryx, Marketing, Performance, Redshift, Snowflake, SQL and tagged INDB, SQL. Bookmark the permalink.